Last week, I enjoyed watching one of my absolute favorite movies – The Ultimate Gift (2006) – with my grandmother, aunt, and uncle. If you haven’t seen it, you MUST watch it immediately. It’s one of my go-to movies, the kind I love to watch or listen to any time. It is the perfect family movie with a message for everyone – one “take-away” is that life is a gift meant to be shared with others. Plus it has a great cast (Abigail Breslin, James Garner [one of my personal faves], and Drew Fuller). So, back to my great evening. 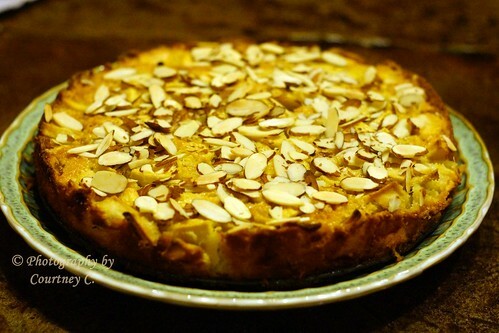 After watching this with my family, we devoured ate most of a DELICIOUS French Apple Cake with Almonds (Yes, I am a little biased because I baked it myself, but when my uncle wants seconds, you know it’s good). The recipe came from Hillary Manton Lodge’s fabulous novel A Table by the Window, which is full of recipes squeezed in between the chapters of the story (like Nutella mousse, pasta carbonara with leeks and lemon, pine nut couscous, and mini focaccia to name a few). The story alone was one I loved, but these recipes are a fantastic bonus. This apple cake was very moist and just sweet enough — and easy to make. It was the perfect end to an evening making memories and enjoying a movie with my family. I would definitely recommend picking up a copy of this book, if only for the recipes. By the way, Hillary is featured in August’s Book Fun Magazine with an interview and recipe for the Provencal Lavender and Honey Pound Cake from the novel. Here’s a pic of my cake. Doesn’t it make you want a piece? Note: I did receive a free copy of this book from the publishers to review (Thank you! ), but this post is just a “fun” one I wanted to share, not encouraged/required by the publishers. Have you seen The Ultimate Gift? What did you think? What’s your family’s favorite movie? Eleanor Braddock’s Shortbread Recipe -Another Extra from “A Beauty So Rare”! Ok, ya’ll. 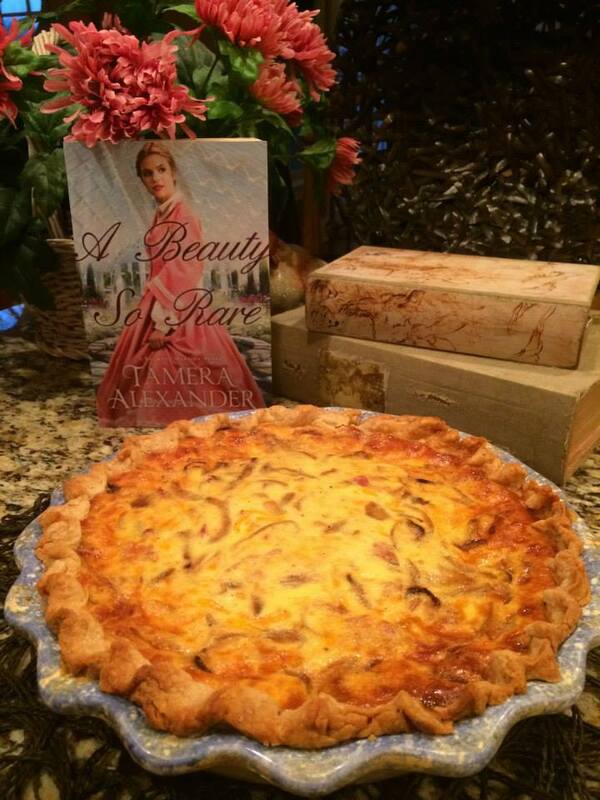 Here’s another fabulous recipe from the oh-so-delightful Tamera Alexander, featured in her novel A Beauty So Rare! Today, it’s character Eleanor Braddock’s Shortbread recipe. I’ve already shared her recipe for a Savory Custard (Ham & Cheese Quiche), and told you about how this book made my mouth water. I’m so glad to be sharing this recipe today. Can we all just take a moment to imagine how this shortbread must smell, warm and buttery, hot out of the oven? While you’re snacking on this shortbread, you should also have the best reading material – so go find A Beauty So Rare! Trust me, it’s awesome. Is there anything that smells as good as homemade shortbread baking in your oven? Oh so scrumptious, and a time-honored recipe. Shortbread is just one of the many recipes included in A Beauty So Rare, the second stand-alone novel in the Belmont Mansion series. Since Eleanor Braddock (the heroine in A Beauty So Rare) is practical to a fault, she makes her shortbread in a cast-iron skillet, so I did the same. Gives you the best crunchy edges and buttery middles! Wish I could share some with you. But I’ll do the next best thing––share the recipe! Have you ever made shortbread? It’s so easy. Preheat oven to 325 degrees, then spray a smaller (8-9 inch) cast-iron skillet very lightly with non-stick cooking spray. You don’t need that much spray. Trust me, the butter in the recipe will take care of that. Cream the butter until light and fluffy. Add the powdered sugar, then the vanilla. Next, work in the flour. You can either mix the flour in with an electric mixer, or you can get into the 1860s way of doing things and knead the dough on a floured surface until it’s nice and smooth. Press the dough into the iron skillet (or you can use a pretty shortbread pan too). Bake for 30-35 minutes until golden brown. Cool for about 10-15 minutes then flip the pan over onto a wooden cutting board. Cut the shortbread into pieces while still warm. It “sets up” as it cools. Or serve it warm. Serves 10-12. And it really does. This stuff is rich and delicious. Hope you enjoy. *Did you know that in 1851, Oliver Chase (of NECCO Wafer fame) developed a mill for powdering sugar which he used in his candy making process? But if a cook wanted powdered sugar back then, refined loaf sugar was pounded into a fine powder in a mortar and pestle. So much easier today, huh? Today, I’m so excited to share about two of my favorite things: books and baking. How could it get any better? Here’s a recipe for a Savory Custard, or Ham & Cheddar Quiche, from Tamera Alexander’s latest book. The main character, Eleanor Braddock, makes it in A Beauty So Rare. Plus there’s a recipe for Old-Fashioned Pie Crust… I’m sure it would be great with a sweet filling, too! I’m currently reading this novel and am happy to be a part of a blogging team that shares fun things like this recipe with you all. (Trust me, there’s more goodies to come, plus a review!) I’m enjoying Eleanor’s story so far – her hardworking and sweet spirit is coming to life on the pages. Sautéonion in the butter in a skillet over medium-low heat for about 10 to 15 minutes, stirring occasionally, until the onion is golden brown. Set aside to cool. When you’re ready to roll the dough for your crust, remove from the freezer and allow to thaw for 15 minutes (if it’s frozen). On a well-floured surface, roll the dough, starting at the center and working your way out. Sprinkle flour over the top of the dough if it’s too moist. If the dough starts to stick to the countertop, use a metal spatula and gently scrape it up and flip it over and continue rolling until it’s about ½inch larger in diameter than your pie plate (or iron skillet).